New 42,900 square foot, 3-storey administration building at the north end of the Cayuga Memorial Arena site (55 Thorburn Street South). 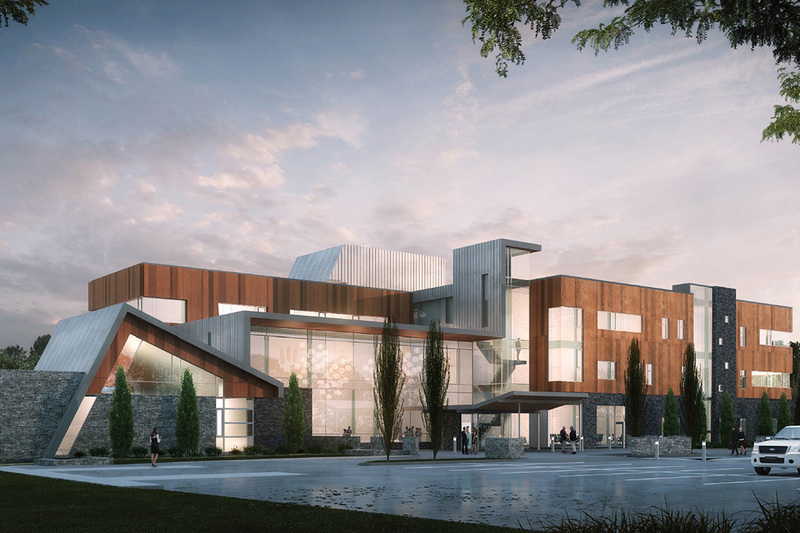 The building will be fully accessible and meet the Leadership in Energy & Efficient Design (LEED) Silver Standard by incorporating eco-friendly materials and features that reduce energy consumption. The new building will, for the first time, co-locate 176 current staff which will generate better, more complete customer service and maximize operational efficiencies. In general, the building is organized to provide Council and Provincial Offences Act (POA) functions and short term customer service needs on the main floor. The second floor provides all of the functions associated with development and business services that have longer customer interaction needs, and the third floor houses the divisions which provide support functions. The central two storey lobby is a glazed, day-lit focal point that organizes the building’s circulation with a direct view to the second floor. The ground floor design includes a separate POA service counter and a main customer service area that incorporates service kiosks and seating. The lobby incorporates display areas that will be used for cultural services programming. Access to natural light throughout the building is a key component of the design with generous windows throughout.